Hundreds of other ‘60s guitarists trod a similar path, and while the lucky few like Mike found that fame provided the means to move up to more expensive instruments, others stuck with their Burns – a bolt on neck Split Sonic, say, or a TR2 semi-hollowbody, with its pioneering active battery-powered pre-amp. Perhaps the good people of Romford who sat down to their breakfast bowl of Rice Krispies in the early months of 1964 were unaware that the “70 Burns Electric Guitars To Be Won” advertised on the front of the packet were made just down the road. Such a valuable promotional deal with Kellogg’s seemed to mark just how successful Ormston Burns had become in little more than four years. By now, the Burns line consisted of six guitars: Nu Sonic, Jazz, Double Six, Vibraslim, Bison, and Shadows. 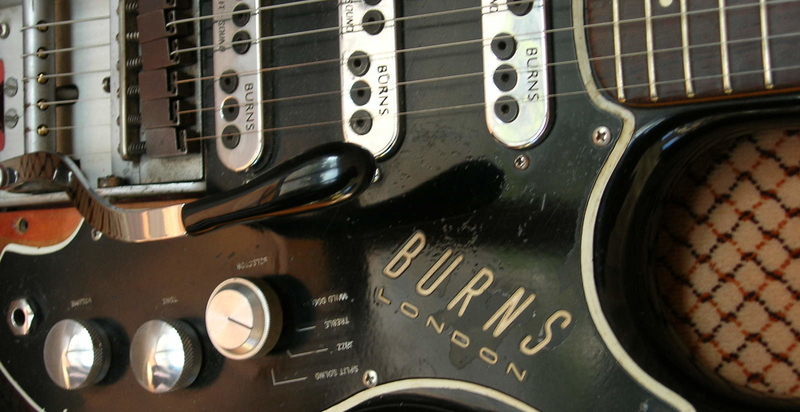 Burns also exported a few guitars at this time to Ampeg in the United States, each with a pickguard bearing an Ampeg by Burns of London logo. The connection with Hank Marvin and The Shadows did the company no harm. Hank wrote about the liaison in a magazine column at the time. There’s nothing he’d rather ramble on about, he said, because there’s nothing quite like playing your own tailor-made guitar. 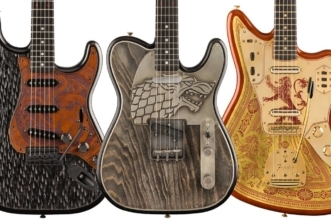 He was well known as a Strat player, and he and the Shads had become role models for thousands of spotty youths who figured an electric guitar must be the easy route to unimaginable pleasures and fortunes. 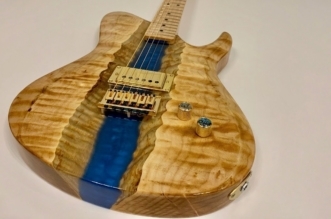 Hank had been wondering for a while about that tailor-made guitar. 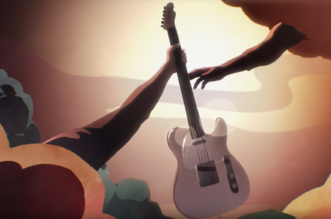 He mentioned the idea to his old music teacher, Ike Isaacs – a guitarist who happened to be involved with model development at Burns. Ike arranged a meeting with Jim. The Shadows guitarist knew exactly what he was after: he wanted a guitar that remained perfectly in tune, even with a wide-range tremolo arm, and if possible he wanted more variation in the tone controls. 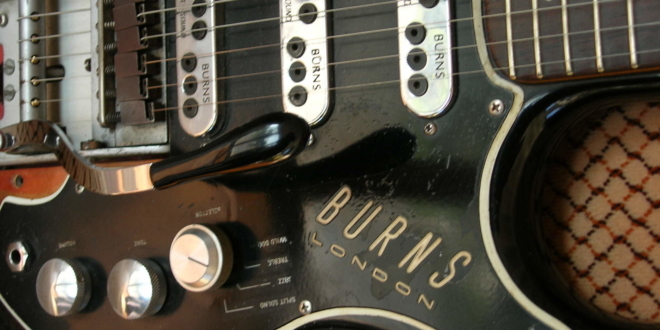 Burns also came up with a similar 12-string version, and Hank received and used an early sample of the guitar that became the Burns Double Six. All these outward signs of success hid the company’s troubling financial performance, not helped by Jim’s idiosyncratic approach to business matters. He sold out to D.H. Baldwin, an American instrument company that specialized in manufacturing pianos and organs. Baldwin wanted to buy a guitar-making operation, and in 1965 it bid unsuccessfully for Fender. Baldwin bought Burns in September 1965 for £250,000, applying the Baldwin brand to many existing Burns models, and then making changes. Two years later, Baldwin bought Gretsch, and by 1970 it had halted the Baldwin-Burns instruments. Jim, meanwhile, got involved in a number of post-Burns projects, including instruments with the brands Ormston and Hayman, and he returned with new Burns guitars in 1974 (as Burns UK Ltd, including the angular Flyte model) and 1979 (Jim Burns Actualizers Ltd, including the bizarrely shaped Scorpion model). By the early 80s, however, Jim Burns was out of the instrument business again. Barry Gibson revitalized Burns in 1992, and his Burns London company is still going strong today. Jim was a consultant until his death in 1998. The hardest part of getting the new operation started, Barry says, was finding ways to tell the world that Burns was out there again and back in production. 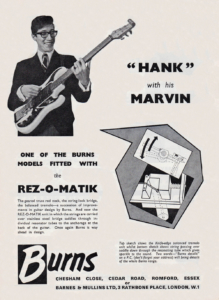 He did a lot of marketing and found himself registering and protecting Burns trademarks. Barry is aware that Burns today has to please at least two quite different markets: the older purists who like to see a Marvin guitar in period-perfect style, and younger guitarists who like the vibe but want something a little different. What would Jim Burns have made of the current state of the “new” Burns company?